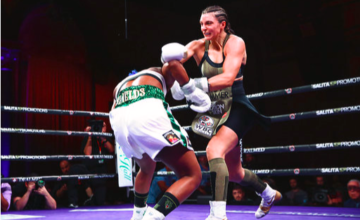 Claressa Shields vs. Christina Hammer for the women’s unified middleweight world championship. Last weekend we witnessed something important and impressive on planet pugilistica. A milestone in the sport for Jab Hook, as he watched the best female professional boxing match he has ever seen. Despite being less than competitive, the matchup was compelling and the action was exciting. All honor and respect to Christina Hammer and to every boxer that has every lost a championship bout. In this current era of boxing when a loss means shame and goodbye to fame, so many fans fail to grasp the meaning of a true contest. 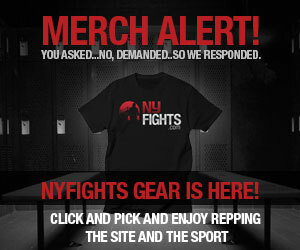 Jab Hook calls this the “myth of the undefeated”. It always takes two to tango. Without a partner, there is no dance. The competition and its outcome are inseparable, the victor and the vanquished are forever dependent. So every winner is only as good as their rival allowed them to be. Just as the conclusion of any contest cannot ignore the pasts of its contestants, the future of the so called “winner and loser” often tell a story more important than any victory or defeat could. What happened before and what happens after the contest, that is how a win and a loss can best be understood and evaluated. Christina Hammer held her middleweight title for over 8 years and successfully defended it 14 times. She is a leader in female boxing and has devoted her life to the sport. Hammer has always sought to fight the best and it was her dream to take those belts from Shields. Bringing the belts home to Germany for her corner, her family and friends, and for all her loyal fans, that was the plan. Alas, reality came crashing in on Hammer as she stood in the ring facing another champion boxer who is simply on another level. Neither she, nor her loving corner, could have been prepared her for what “T-Rex” and trainer John David Jackson had in store for them. It is fair to say that they were in way over their heads. Props to Christina Hammer, who took it like woman and survived till the last bell. Halt die Ohren steif Champ! Champions have a certain intensity about the way they fight which is visible to the informed and literally palpable to their opponents. When this dinosaur dame danced into her domain, dinner was waiting and hungry was “T-Rex”. But she ate like a lady, not too quickly, and when she took big bites, she chewed nicely, enjoying the flavor. 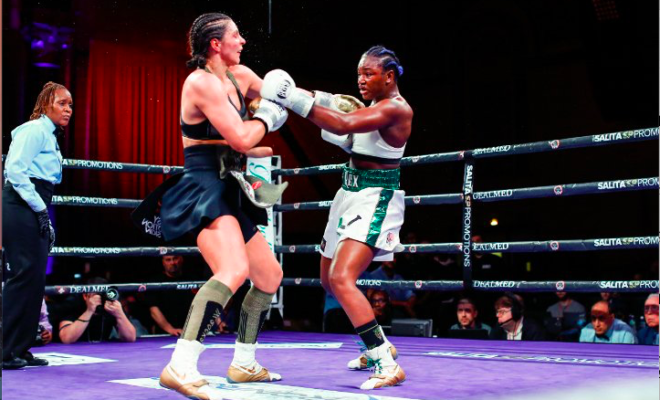 Claressa Shields has emerged as a complete pro boxer in only her 9th bout. Not a wiff of “l’odeur d’amateur“ on the real World Champion from Flint. “T-Rex“ came out focused and ready to do damage and Hammer knew she was in deep trouble after less than 20 seconds into the bout, as Claressa’s 1st of many right hands smashed the face of the German boxer. T-Rex“ came out focused and ready to do damage and Hammer knew she was in deep trouble after less than 20 seconds into the bout, as Claressa’s 1st of many right hands smashed the face of the German boxer. Gone were the wasted movement and thoughtless punching, the show-boating and the loading up on shots. Shields took the plan that JD Jackson had developed for her and flawlessly implemented it. She was patient, mature, and creative in her boxing. Claressa Shields has certainly earned the right to be called “Champion“ in perpetuity. At 17yo Claressa Shields won her 1st Olympic Gold, at 21yo her 2nd Olympic Gold breaking new ground in US Olympic boxing. At 22yo in her 4thpro bout Shields won two world titles at super middleweight. At 24yo “T-Rex” became a two division champion as she went down to middleweight and won two more world titles. In her next bout four months later, Claressa won her third middleweight belt. A couple of days ago, at the age of 25yo, this great athlete and champion unified the world middleweight title and won the first ever Female Championship Belt from the Ring. 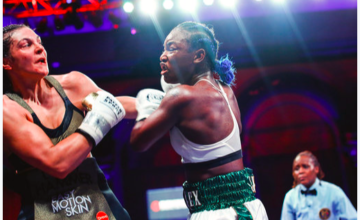 Claressa Shields has followed an incomparable pathway, writing boxing history as we all try to fathom what we have seen. Per definition, it is not possible for a young boxer to be the “Greatest Woman of All Time”, as she is still boxing and lots can happen over the years. However, no female boxer has ever accomplished what Shields has already done, get the picture? GWOAT titles are really for dead boxers, or at least retired prizefighters. Take your time “T-Rex,” legacies take a lifetime. 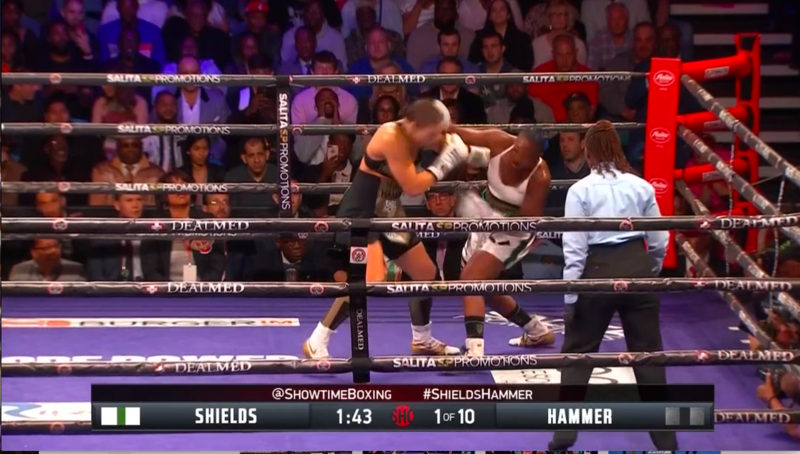 Jab Hook picked Claressa Shields to win a dominant, unanimous decision over Christina Hammer. Epilogue on the Minneapolis Armory, Minneapolis, Minnesota, USA by Jab Hook. Jack Culcay is the 2nd German boxer fighting for the 2nd time in the USA this weekend. Christina Hammer also fits that description. Culcay impressed Jab as he made it a closer bout than had been expected. His strategy of aggression and power punching may not have been the most natural for “Golden Jack“, but he did his best to gain respect. Waiting and watching crept into his tactics for no good. Culcay, in gold trunks on the right, made it closer than most all expected. 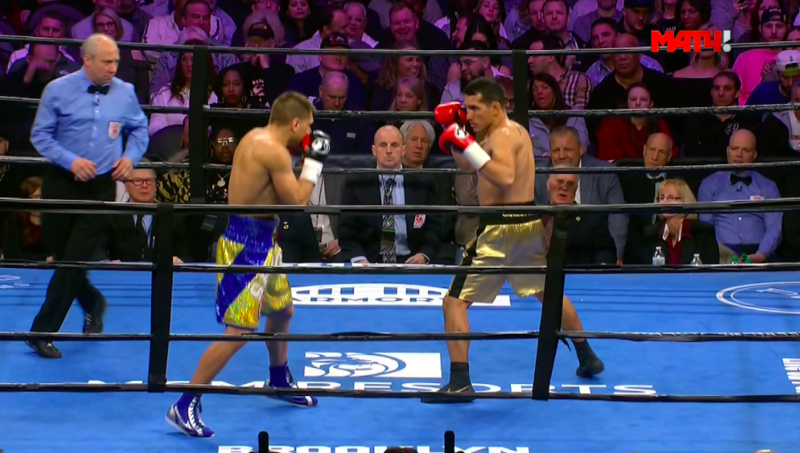 Derevyanchenko took control early, got ahead by being busier and more accurate, then held on in the later rounds. A lack of initiative and urgency plagued the German Ecuadorian fighter for most of the bout. Too little to late, as Culcay came on strong in the latter rounds. “The Technician” did enough to win, but failed to really impress. Daniel Jacobs will teach Sergiy a 2nd lesson, if they meet again. Be careful what you wish for Brother-chenko. “Golden Jack” should move to Miami and crash the party at major middleweight events in the USA. He could get bouts and would be perfect as a last minute replacement for a title bout. Jab predicted that Derevyanchenko would defeat Jack Culcay via unified decision. Hook was 4 for 4 on the weekend, praise the lord!